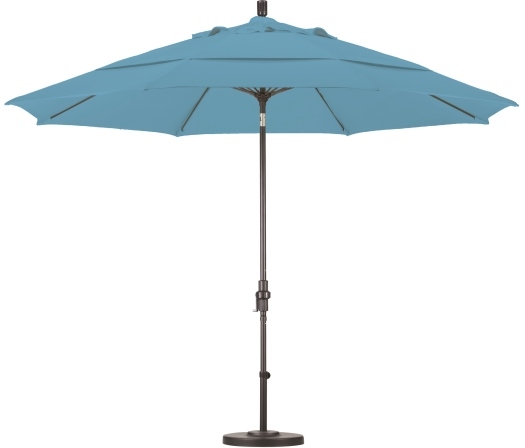 Huge oversized 11 foot Patio Umbrellas with Auto Tilt on chocolate brown commercial frames. Huge oversized 11 foot Commercial Patio Umbrellas with Auto Tilt on chocolate brown commercial frames. Huge oversized 11 foot patio Umbrellas on silver commercial frames. Huge oversized 11 foot patio Umbrellas on white commercial frames. 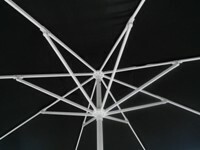 Huge oversized 11 foot commercial patio Umbrellas on white commercial frames. Fade resistant 11 foot olefin canopy on durable fiberglass canopy support. Alto118. Ships within 10 business days. Fade resistant 11 foot olefin canopy on durable fiberglass canopy support. GSCUF118. Ships within 10 business days. Eleven foot aluminum pole market umbrella with fade resistant Pacifica cover. alto 118. Ships within 10 business days. 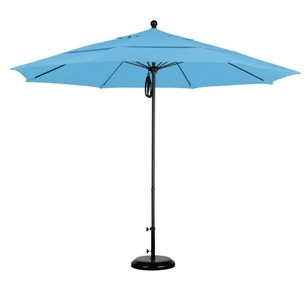 Eleven foot aluminum crank market umbrella with fade resistant Pacifica cover. GSCUF118. Ships within 10 business days. Fade resistant Pacifica canopy on durable wooden frame support. WOFA118. Ships within 10 business days.